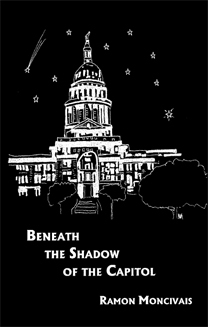 Ramon Moncivais’ Beneath the Shadow of the Capitol depicts a facet of Texas history about which not enough has been written. As someone who grew up in this era and experienced much of the discrimination described therein, I am pleased that this book is filling an important role in Texas history. It sheds light on understanding the joys and pains of growing up Mexican Americanin Texas. Ramon writes with a passion to tell what most Hispanics went through in the Austin school system of the ’30s, ’40s, and ’50s. Without animosity, he tells of journeys rarely spoken of but never forgotten. He writes what he and every Hispanic lived. Ramon’s story needs to be told, not just so we can share in his feelings but also because of the lessons it teaches us. We need to learn to stand up and demand that Mexican Americans be treated as first-class citizens, so the fabric of our society can gain the strength it needs to be sustainable and healthy. Congratulations, Ramon, for having the courage to speak clearly about deplorable conditions that existed in our city and that damaged the spirits of so many of our Mexican-American citizens. Ramon’s book is a must read. It tells of history and life that is unknown to many, except for those that experienced it. And I will never forget it.